Water Street Home Duck…Duck…Duck…Environmental Stewardship! Imagine you’re out for a stroll on the waterfront on a beautiful spring day. The harbor is bustling, the birds are chirping, boats are buzzing by – and suddenly, out of nowhere, appears a giant rubber ducky. Have you stumbled into Ernie from Sesame Street’s dream world? No, you’ve most likely happened upon Dutch artist Florentijn Hofman’s six-story inflatable art installation, aptly named Rubber Duck. Hofman’s take really does put things into perspective. If you’ve ever shared a bathroom with roommates, you know the importance of all parties keeping a commitment to cleanliness! When we think of our planet in a similar way, it drives home the point that as businesses and individuals alike, we have a shared responsibility to do our part to protect the environment that we all share. Especially now, with the threats posed to our planet by climate change, Rubber Duck’s message couldn’t be more important. A few weeks ago on Earth Day, I talked about some easy tips we can all do to help protect our water supply, and as the globetrotting ducky makes a stop in the U.S. in June, it’s a good reminder to have this message stay top-of-mind every day. Keep an eye out for it the next time you’re out for a walk by the water…you never know what you may see. And be sure to do your part to keep our global bathtubs clean. P.S. 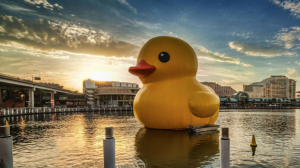 American Water started a petition to bring this duck to the Delaware River, between Philadelphia and Camden, N.J. Click here if you’d like to sign it. Bring this duck to the Delaware River, between Philadelphia and Camden, N.J.
Puddles has sunk! Reports out of China indicate the duck has leaked and begun to deflate/sink. On Wednesday, Harbour City tried to assuage people’s grief. “We are just doing normal checking,” said Sandy Lee of Harbour City. “Because it’s Victoria Harbor, the waves are strong,” which had likely caused any leaking, she said. No vandalism was involved, the mall said. If you want to get the duck more exposure to the public, send him along for the MR -340 which starts in Kansas City & ends in St. Charles. Or you could let him float from the finish of the MR-340 down to the riverfront in front of the arch.